Leeds College of Art and Design - I was Lecturer in Creative Writing at LCAD, with students drawn from Photography, Fine Art, Creative Advertising, Graphic Design, Sculpture and Textiles. Sadly, due to cuts, the College has chopped back its programme, and loads of the optional creative courses have bit the dust - including Creative Writing (despite a spirited defence of it by my three years of students). 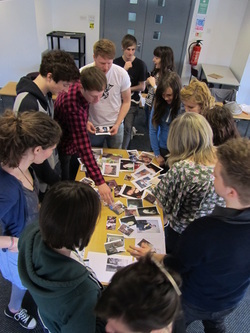 The photo is of some of my students working on a photographs-to-feature-film exercise. I have to say that the Creative Advertisers, and the Graphic Designers really excelled at this exercise, whereas the Fine Art students got very bogged down in it. It's always interesting to see how different disciplines of visual artists react to the different exercises I set them!